Customer must have a printed copy or a digital image of their receipt at the time of checkout. There is a 1 (ONE) hour grace period for reservations, if you are over a hour late from the time your reservation ends or your stay was extended, you will be charged the regular daily rate for the additional time. No exceptions. Holiday Inn HOU Airport is a great parking option located only 0.5 a mile away from the airport with 24/7 shuttle service at a very competitive rate! ***Shuttle Service: Call front desk to request a pick up after claiming baggage. This lot is not available at the moment. 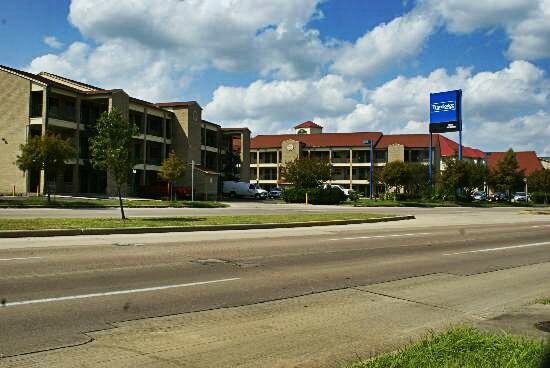 Located minutes away from Houston Hobby Airport. Free shuttle service to and from airport included with online purchase. No extra charges for full-size vans, pick-up trucks and large SUV's. No room reservation needed. Compare our rates to Houston Hobby Airport rates! Upon your arrival, park your vehicle and then go to the front desk with your luggage. Be ready to present the copy of your parking reservation and wait for the shuttle that will transport you to the airport. Upon your return please wait at zone 3 section 14 near the local metro bus stand. Please ensure you contact the parking location to request the shuttle after you have claimed your luggage and you are ready to be picked up.